Many critics believe actress Michelle Williams (9-9-1980) is one of the most noteworthy actresses of modern times. With her platinum blonde short pixie hairstyles, her tragic love affair with the deceased Heath Ledger and her single parenthood to Matilda Rose, she cuts an intriguing image. Michelle is also the darling of the fashion industry. Her short platinum blonde pixie has a hidden and sad significance. 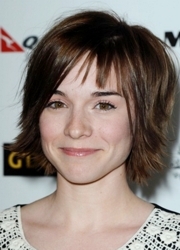 She revealed to the media that she sticks with short hairstyles because Heath preferred her hair that way. Since his tragic and untimely death it is her way to pay him tribute. For the October issue of Vogue magazine Michelle was featured on the cover for her upcoming role in My Week With Marilyn. Michelle pulled out all the stops for the cover in order to showcase her best take on the famous Norma Jean. Vogue responded in kind having the cover shot by famed photographer Annie Leibovitz. Oribe did Michelle’s hair and her make-up was done by Linda Canello for Giorgio Armani Beauty. Celebrity hair colorist Anthony Palmero created the drop dead gorgeous platinum blonde color for Michelle’s short wavy Marilyn Monroe hairstyles. Palermo who is the color director of New York City’s Anthony Leonard Salon worked his magic to create the perfect platinum hue Marilyn was famous for wearing.Palermo reported that achieving the right shade of platinum took some research. Palermo, is known for doing blondes and has worked with blonde celebs like Maria Sharapova, Madonna and Scarlett Johansson to name a few of the celebs he works with. He did his homework looking at lots of different reference. He reported looking at lots of photos from a range of different eras. He also investigated how Marilyn actually colored her hair. It took some testing before everyone was satisfied that they had an exact match to Marilyn’s hair color. If you want to instantly copy Michelle Williams or Marilyn’s short hairstyles you can do so almost instantly by sliding on a gorgeous platinum blonde short wig from WigSuperStore which has a huge selection of gorgeous wigs in both 100% human hair or synthetic. Palermo utilized the platinum colors made by Wella on Michelle’s current short hairstyle. He reportedly bleached the hair to remove any color, toned with a 20-volume developer and then mixed a combination of Wella Color Charm tones with Royal Blonde and Nordic Blonde for the bombshell blonde. Reportedly Marilyn struggled with keeping her roots perfectly touched up. As a result Palermo decided to leave a little root color to cream a more modern version of Marilyn. Michelle had her hair colored at Palermo’s salon. The celebrity hair colorist reported that the natural blonde star loved going to an extreme platinum blonde hue. Short hairstyles are ideal for going with such a dramatic platinum blonde. Bleaching hair almost always causes some residual damage ranging from extreme dryness to breakage. The longer the hair which is bleached, the more damage. Going short and then adopting a dramatic bleached blonde is the best of both worlds. It’s also easier to keep your roots under control, if that’s your goal, with shorter hair. Any hair colorist worth their salt will warn prospective platinum clients of the high-maintenance issues. When done right, extreme platinum is worth it because it’s the ultimate bombshell blonde. If you want to look like Marilyn or Michelle it’s the only way to go. This entry was posted on Friday, November 18th, 2011 at 3:38 pm	and is filed under Short Hairstyles. You can follow any responses to this entry through the RSS 2.0 feed. Both comments and pings are currently closed.